The Monk Athanasii (or Afanasii), Hermit of Pechersk in the Nearer Caves, was a contemporary of the Kievo-Pechersk monastery archimandrite, the Monk Polikarp (+ 1182, Comm. 24 July). The Monk Athanasii for a long time was grievously ill. When he died, the brethren prepared him for burial. And on the third day the hegumen came to bury him. But they all beheld, that the dead one was alive, – he sat there and wept. To all their questions he replied only thus: "Seek salvation, in everything have obedience to the hegumen, repent each hour and pray to our Lord Jesus Christ, to His All-Pure Mother and to the Monks Antonii and Theodosii, so as to end good the life here. Ask ye no more". After this he lived for 12 years more in solitude in a cave and in all this time he spoke not a word to anyone, he wept day and night, and only every other day did he partake of a little bread and water. Only just before his death, having assembled the brethren, did he repeat his earlier spoken words to them, and then he peacefully expired to the Lord (in about the year 1176). 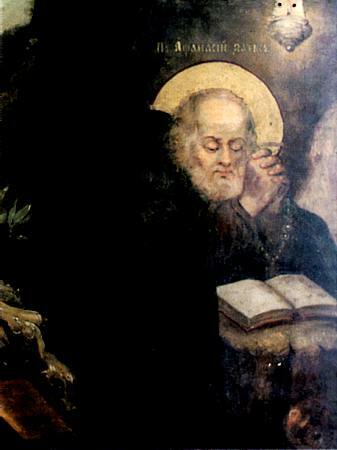 The monk Vavilii, many a year having suffered illness and a weakness of the legs, was healed at his relics. "One time I did lay there, – he related to the brethren, – and I cried out from sharp pain. Suddenly to me there came Blessed Athanasii and said: come to me, and I shalt heal thee. I wanted to ask him, how and when he had come here. But he became invisible. I however was convinced of his appearance and besought, that I should be taken to his relics. And indeed, I have been healed". The Monk Athanasii was buried in the Antoniev Cave. His memory is celebrated also on 28 September and on the 2nd Sunday of Great Lent.